Please see our How to place an order page for details. Please see our Customer Account page for details. It's easy to shop on our site! You can find any product by using one of the six different methods. Search for products by inputting the Key Words such like the Brand/Product name or Motorcycle Manufacturer/Model which adapts them, then the corresponding products will be displayed. By specifying more detailed conditions for searching, you can narrow down the corresponding products. You can search for products from the Keywords/Brands/Price Range section. You can look for products by searching for your own motorcycle. The corresponding products will be displayed by Manufacturer/Displacement/Motorcycle Model. When the products are already determined, you can search for them by the brand name. The brand name is displayed in alphabetical order. Choosing either of them, the products will be displayed. You can search for the products from the Accessories Category. Choosing either of them, the corresponding products will be displayed. When you can't locate a product or you would like to get more information about a specific product, please e-mail us at jp_info@webike.net. You will now be able to obtain related latest information about your bike. *This service is only available to registered Webike Japan members. Click here for "My Acount" page. You are allowed to select multiple vehicle types. By all means, please select your bike! Please search for your vehicle make on the Model Page. 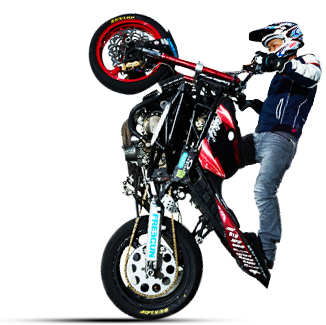 If you no longer wish to receive information on a particular bike, please take a look at that bike's product page. After you click the "Don't need information on MONKEY? Click here" button, you will no longer receive information on that particular bike. For each item available at Webike Japan, the retail price displayed is in Japanese Yen. The item price does not include shipping charge. Please make sure to place your order online. Before you complete placing your order, you will be able to see the order details including the shipping charge. For your reference, we also display the item price in other currencies. It is calculated at the exchange rate of the day. * The exchange rate may differ from the actual rate. * If you are paying by Credit/Debit card, you may be charged more of what you are charged for currency conversion fee compare to paying from PayPal account. We strongly suggest you to create your own PayPal account. Please refer PayPal Currency conversion fee chart for more detail. If you are receiving your order outside of Japan, you may be required to pay import duties and taxes at the time of delivery in each customer's country of residence. These and any additional charges for customs clearance are your responsibility. In that case, applicable fees and taxes are to be paid by the addressee. Most of the items displayed on our website are not in our stock. We place an order to the manufacturer after having an order from our customers. Therefore, please understand that it will take a few days to check and reply to you whether the manufacturer has it on stock or not. You can see the "usually ship within …." message on the each items screen. This applies only if the manufacturer has the item(s) in stock. The accurate shipping date will be notified to the customer via e-mail. Please note that we are continuing your order if the item(s) you have ordered will arrive to our warehouse within a month (excluding weekends). As Webike quote to manufacturer, we will ask our customer if they wish to continue their order that will take more then a month to arrive to our warehouse, such called "Back order". One you agree to continue your back order, we can not cancel them for any reason. We do accept the cancellation of the items only if they don't say "it can't be cancelled after placing an order". If the item(s) has not been shipped, please let us know and we will make an refund within 24 hours after accepting your cancellation. If the item(s) has already been shipped to you, simply return the item, and we will refund the purchased price (shipping fee is non-refundable). Please see our Return Policy page for details. 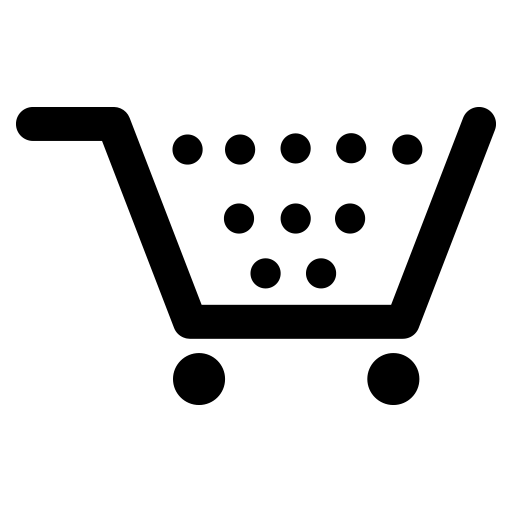 Add an item to the shopping cart by clicking the "Add to Cart" button on product's page. You can view items in your shopping cart at any time by clicking on "Cart" located at upper right corner of our website. You can delete items you don’t want to order from your shopping cart by clicking on "Delete" button. The quantity of each item in the shopping cart can be changed by editing the number of items and clicking the "Update" button. You may delete, add or change items only before proceeding to order. We can not accept any changes or additions of items after your order has been placed. 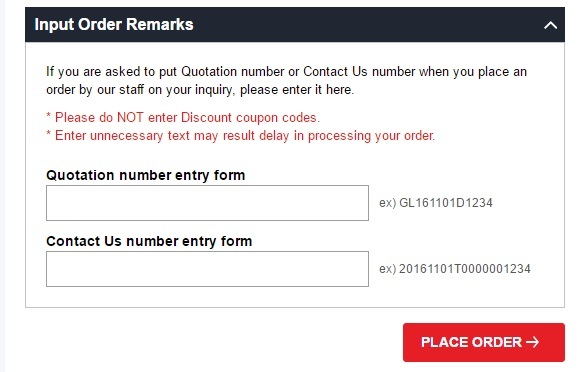 If you are asked to put Quotation number or Contact Us number when you place an order by our staff on your inquiry, please enter it in the form like below. It makes us easy to process your order. * Please do NOT enter Discount coupon codes. * Enter unnecessary text may result delay in processing your order. Please understand that we cancel your order for various reasons. We make the refund as we cancel your order and you may receive the refund in different from what you have paid due to the change in the currency. This currency is set by your credit card company. Please understand that we are refunding the full amount of the item returned in Japanese Yen and we are not responsible for money lost or gained due to the transaction. Any handling fee charged by the credit/debit card for your transaction are to be paid by the customer and Webike is not in responsible for any loss due to cancelling your order. You may come against an error when you proceed to purchasing the items. This occurs when your credit card can not be used, or PayPal or Alipay account's balance is short. Please check your account and place an order again. We may put your order on hold if the order is too expensive or if we believe your order is unauthorized. If we are to send the confirmation mail and ask you something about your order, please reply to the e-mail, otherwise we may cancel the order. You can check on the status of all your orders in My Account. Should you have any questions about shopping at Webike Japan, please e-mail us at jp_info@webike.net. We may combine all the orders in progress in one package, if necessary. Please understand that we will not be in responsible for customs or any tax you may need to pay to receive the item. We are sorry to inform you that you cannot add or modify products if once you place an order due to our system circumstances. If you would like to add products or modify your order after it has been placed, please choose from the following methods below. 1.Cancel your order once, and place another order for all of the products that you would like to purchase. (At the time of your cancellation, there is a possibility that the original shipping cost can not be returned). 2.Place another order for the products that you would like to add. (We will not be able to combine the shipment). If your order has not already been delivered, or is not on its way to being delivered, we can cancel it. Should you decide to cancel your order, please immediately contact jp_info@webike.net with your order number. If you would like to change the product for other merchandise, simply cancel the whole order and place a new order after we accept the cancellation. If your order has already been processed, it may be too late to cancel the shipment. If so, simply return the item, and we will refund the purchase price. Unfortunately, the original shipping cost is not refundable. Wholesale member can NOT cancel their order under his/her circumstance once the order has been placed. Please see our Return Policy page for details. International customers are considered importers and must comply with all laws and regulations of the country in which the orders are received. You may be subject to import duties and taxes, which may be levied once the package reaches your country. If that happens, additional charges for customs clearance must be borne by you. We cannot predict or control what these charges may be, as they vary widely from country to country. Please contact your local customs office for further information. Also, we are required to show the accurate value of the items directly on the package. In some countries, couriers may charge clearance fees independently from the customs duty for processing the packages through the customs. For more information on what these fees might be, please contact the post office of the country in which you are receiving your order.